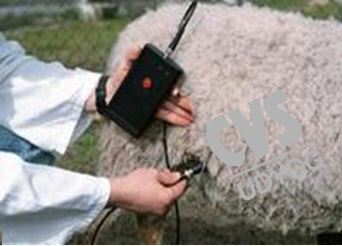 CVS 294 This is a fully portable, cost effective, ultrasonic instrument which identifies whether or not an animal is pregnant with maximum accuracy animal and the elimination of pregnatn animals and the elimination of labour and feedingcasts asscociated with barren sows and ewes. The detector determines pregency by locating amniotic fluid in the uterus. The testing procedure is easily implemented by simply pressing the ultrasonic probe aginst the animal's skin. When pregnancy is detected, the instrument signls this not only with a rapidly flashing indicator, but also with a high-frequency acoustic signal. only one button is used for operation. For sows, where teasting can be performed between 15 and 75 days after breeding or insemination, with best results being achieved between 25 and 30days. The PREGNANCY DETECTOR for sheep can be used between days 60 to 120 days after mating. The most objective time recommended for accurate diagnosis is from 90 days after mating when the fluid-filled enlarged uterus drops closer to the abdominal wall. 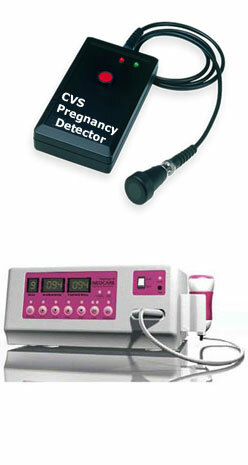 PREGNANCY DETECTOR for pigs can be used between days 15 to 75 days after breeding. The most effective time recommended for accurate diagnosis is about 25-30 days after breeding.